Santa Clara, California, June 29, 2017 – Crocus Technology, a leading developer of an MLU™ based TMR magnetic sensor technology and embedded MRAM, today announced the release of its 2nd generation Digital Magnetic Latch, the CT83x series. In response to a market gravitating towards high sensitivity, low power consumption, and small form factor, solid-state magnetic latches, Crocus is pleased to introduce the CT83x. The innovative TMR latch is a monolithic chip which offers Omnipolar, Unipolar, and Bipolar modes of operation with a variety of sensitivity levels and operational frequencies in addition to an option for digital and analog outputs in a single package. The monolithic, extremely low power consumption, and small form factor (1.4x1.4x0.45mm) CT83x is perfect for consumer and medical applications such as mobile phones, tablets, notebook, Bluetooth headsets, hearing aids, and liquid flow meters. The high temperature operation of the CT83x, without significant degradation in performance, allows designers to develop applications which require accurate magnetic sensing levels over a wide-range temperature profile. 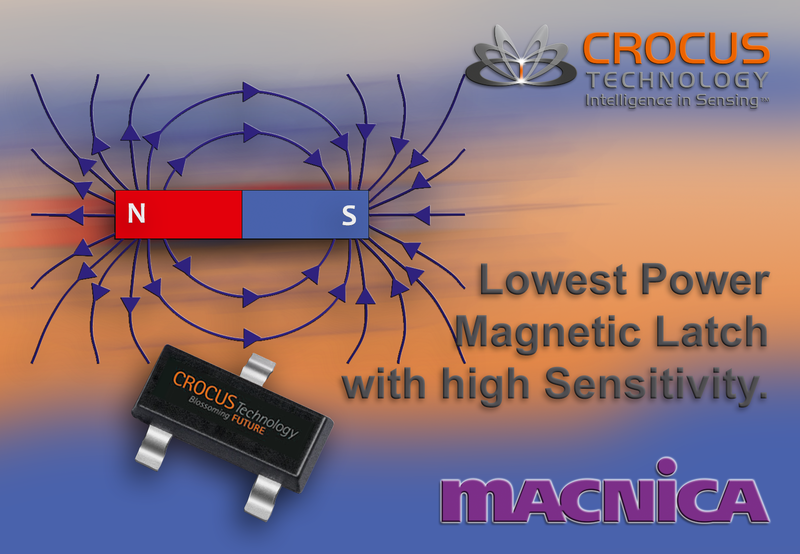 Crocus Technology develops and supplies magnetic sensors and embedded memory solutions based on its patented TMR-based sensor technology, Magnetic Logic Unit™ (MLU™). Crocus’ magnetic sensors bring significant advantages to the industrial and consumer electronic applications requiring high sensitivity, stable temperature performance, low power and low cost. MLU also enables high speed, lower power, and endurance to embedded memory solutions aimed at consumer electronics. Crocus is headquartered in Santa Clara, California, and has offices in Grenoble, France. For more information, please visit http://www.crocus-technology.com.